Suburbs: Backyard Chicken Coop provides adults with all the informa- tion they need to successfully care for and keep laying hens. And Fairy Garden Terrariums encourages kids to use their imagination to plant a garden for fairies using flowers, wood, and rocks. The library also partners with organizations like the Wellesley Conservation Council and Land's Sake Farm in Weston to provide pro- grams about bird watching, geology, conservation, and more. For infor- mation on upcoming events, visit www.wellesleyfreelibrary.org/events. Wellesley Conservation Council Programs (WCC) "I've lived in Wellesley for 70 years. The woods and open space we have here are a rarity, and we need to take care of them." – Pete Jones, WCC Board Director This privately run organization was founded in 1958 by a group of concerned residents who wanted "to protect and preserve natural areas in Wellesley, educate the public about the need for conservation, encourage the appreciation of natural history, and acquire and hold land for the benefit of the public." Today, the Council continues to teach families about how important it is to have green space, clean air, and clean water. "The WCC has developed a number of programs to educate people about the flora, fauna, and trails in Wellesley," explains Jones. WCC holds two programs a year — one in the fall, which usually exposes primary school children to live animals, and one in the spring designed for adults. The WCC also does Sunday morning bird walks at Guernsey Sanctuary, Wellesley's largest sanctuary, throughout the year. For more information visit www.wellesleyconservationcouncil.org. Natural Resources Commission Nature Programs "Our goal is to instill an appreciation for our environment and the rich resources we have at our disposal." 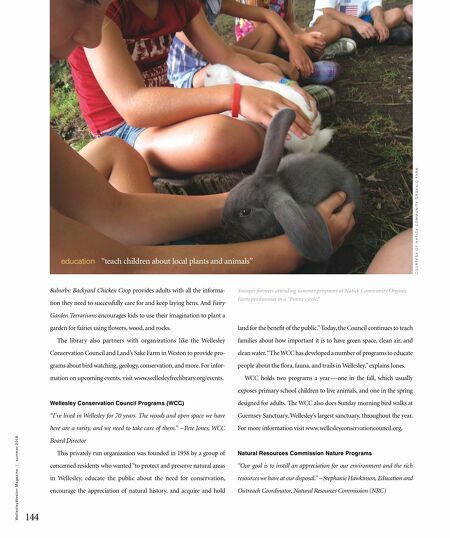 – Stephanie Hawkinson, Education and Outreach Coordinator, Natural Resources Commission (NRC) C O U R T E S Y O F N A T I C K C O M M U N I T Y O R G A N I C F A R M Younger farmers attending summer programs at Natick Community Organic Farm pet bunnies in a "bunny circle." W e l l e s l e y W e s t o n M a g a z i n e | s u m m e r 2 0 1 8 144 education "teach children about local plants and animals"